On Wednesday, more than 4,000 pro-life citizens gathered in the Illinois Capitol Rotunda to protest two radical pro-abortion bills currently pending in the Legislature. 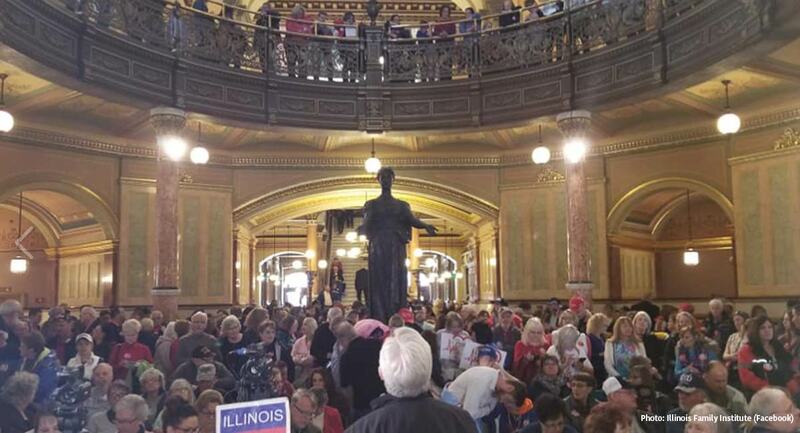 According to the Illinois Family Institute, the pro-life demonstrators filled the rotunda to capacity, prompting the fire marshal to close the Capitol doors. Attendees, many carrying signs reading “Protect Life,” filled the rotunda and, after the Capitol was at capacity, formed a long line outside the building. As previously reported by Live Action, HB 2495 is a radical proposal that would remove all legal protections for the preborn making abortion legal up to and potentially even during birth as the bill would repeal the partial-birth abortion ban. Additionally, the pro-abortion bill would remove virtually all conscience protections for pro-life health care workers, allow for infanticide following a botched abortion, and allow people who are not doctors or even nurses to commit abortions. In a press release for the rally, organizers noted that, if enacted, the legislation would make Illinois a late-term abortion destination. Disturbingly, the legislation would also mean that no abortion facilities in Illinois would be subject to state inspection. Organizers note that since 2011, at least four abortion businesses in the state have been forced to shut their doors following failed inspections. A recent 911 call from an unlicensed abortion facility in Illinois demonstrates the potential consequences of allowing a wholly unregulated abortion industry. Leading up to the rally, more than 12,000 Illinois residents submitted formal objections to HB 2495. A companion bill, HB 2467, would repeal the parental notification requirement for a minor undergoing an abortion. More than 11,000 state residents submitted formal objections to this additional bill. Wednesday’s event was hosted by Illinois Right to Life Action, Pro-Life Action League, and Illinois Family Institute, and was live-streamed. Speakers included several state representatives, a post-abortive mother speaking on behalf of Silent No More, the head of a pregnancy resource center, a pastor, and Bishop Thomas Paprocki of the Catholic Diocese of Springfield.